Two studies published in the December 14 issue of JAMA found that common causes for stillbirth include obstetric complications and placental abnormalities, while factors that could be known at the start of pregnancy, such as previous stillbirth or pregnancy loss, also are associated with an increased risk for stillbirth. Emory is one of five clinical sites in the Stillbirth Collaborative Research Network, funded by the National Institute of Child Health and Human Development of the National Institutes of Health. 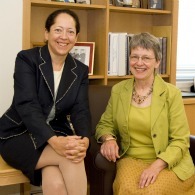 Carol Hogue, PhD, MPH, and Barbara J. Stoll, MD, co-lead the Emory site for the network and served as co-authors for the studies. Hogue is the Terry Professor of Maternal and Child Health, professor of epidemiology and director of the Women’s and Children’s Center at the Rollins School of Public Health. Stoll is the George W. Brumley, Jr. Professor and chair of the Department of Pediatrics at Emory University School of Medicine, chief academic officer of Children’s Healthcare of Atlanta, and president of the Emory-Children’s Center. According to Hogue, this is the first study to determine the causes of stillbirth in a racially and geographically diverse population in the United States. Researchers found that obstetric complications and placental abnormalities were the most common causes of stillbirth, while genetic abnormalities, infection, umbilical cord abnormalities, hypertensive disorders and maternal medical complications also contributed. Because of the racial distribution in Atlanta, the Emory site added to the diversity of patients who were included in the national study. Researchers found that non-Hispanic black women experienced more stillbirths associated with obstetric complications compared with non-Hispanic white women and Hispanic women combined. Cord abnormalities were associated with more stillbirths in non-Hispanic white and Hispanic women compared with non-Hispanic black and other women. Another study in the December 14 JAMA, conducted by the Stillbirth Collaborative Research Network Writing Group, examined the relationship between risk factors that could be addressed in the early stages of pregnancy, particularly the contribution of these factors to racial disparities in stillbirth. Women who had previous stillbirths or who had never given birth also had an increased risk of stillbirth.